Cannabis use and its long-term effects on human health have long been studied to protect the safety of patients and recreational users alike. While the general consensus amongst many researchers is that the benefits of medicinal cannabis use outweigh the potential side effects, there are other safety risks that need to be considered, such as the possible presence of contaminants. The very fact that cannabis is a plant and not a synthetically made drug increases the risk of contamination as the conditions needed to grow cannabis plants are also ideal for the propagation of harmful microbes. This risk can also be exacerbated by poor production practices. For example, the harvesting or storage of cannabis plants while they are wet may create humid conditions which can lead to the growth of fungal mold or harbor mite infestations. Other common contaminants such as pesticides, heavy metals, and residual solvents can also be introduced in the growing and processing of the cannabis plant. 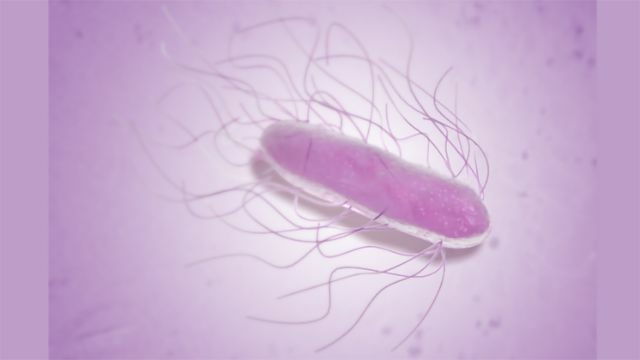 There have been several outbreaks of Salmonella that can be traced back to contaminated cannabis plant matter, the most prolific of these being a 1981 outbreak that resulted in 85 cases of salmonellosis across multiple American states. Fungal spore infections have also been a concern with cannabis. Aspergillus mold has been detected in some commercially available cannabis materials, which can be of significant risk to immunocompromised patients, who are susceptible to contracting potentially deadly Aspergillus-related pulmonary diseases. To control these microbial contaminants, it is common for cannabis producers to use pesticides and insecticides on their plants. Unfortunately, these pesticides can go on to create issues themselves if they are not thoroughly removed from the plant matter during processing as many fungicides and insecticides can be harmful to human health. 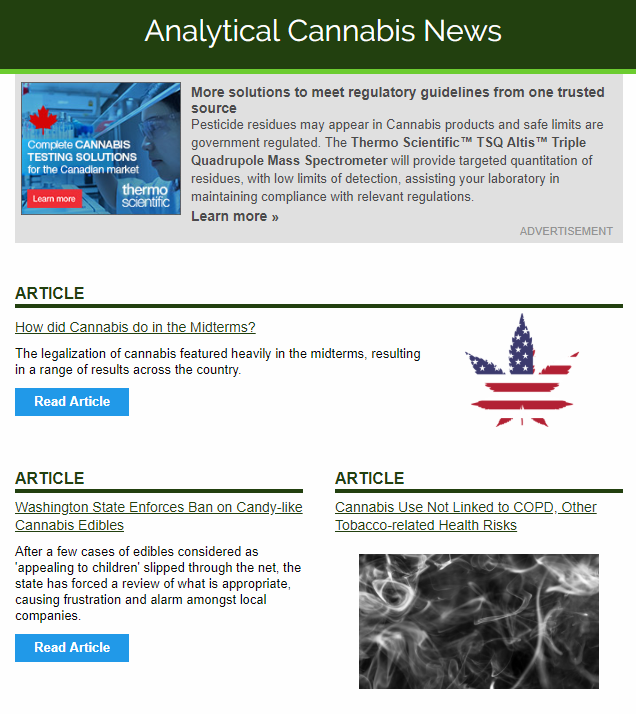 There are recorded cases of the insecticide ethoprophos (a carcinogen and cholinesterase inhibitor), the fungicide azoxystrobin (an endocrine disruptor and possible developmental toxin), and other dangerous pesticides being detected in cannabis samples available for sale in the United States. Some of these pesticides were only detected in trace amounts, but several potentially toxic pesticides were detected in extreme levels, up to tens of thousands of parts per billion. In addition to these contaminants, cannabis plants can also absorb heavy metals from the soil they are grown in. Cannabis plants are known to be “hyperaccumulators”, meaning that they can take up compounds from soil into their roots and leaves more efficiently than other types of plant. This hyperaccumulatory behavior means that soil-borne heavy metals like cadmium, can be readily absorbed into the cannabis plant matter. High levels of cadmium contamination can be dangerous to human health and it is known to harm kidney function and, in extreme cases of prolonged exposure, can lead to renal failure. Heavy metals can also contaminate cannabis matter through direct cross-contamination during processing. There are even recorded cases of toxic lead metal being deliberately added to street-sold cannabis to increase its weight and consequently its street value. It is important to note that most of the existing literature on these cannabis contaminants comprises of case studies, and more rigorous scientific study is required to understand their prevalence and risk. The presence of contaminants alone does not guarantee that a cannabis sample will be harmful when consumed. Cannabis is most commonly consumed through smoking, but it can also be consumed orally. The method by which it is consumed can affect the bioavailability of the chemical components of cannabis, and so it follows that it will also affect the bioavailability of certain contaminants and the risk they pose. The heat involved in the combustion of cannabis during smoking can lead to chemical reactions involving any contaminants that are present. Many pesticides, for example, are highly volatile substances and, as a result, will burn readily. Laboratory experiments involving the burning of deliberately pesticide-spiked cannabis plants have shown that up to 69.5% of the pesticide residue present on the plant could transfer into the cannabis smoke being inhaled by the user, though this figure is highly dependent on the smoking apparatus used. Oral ingestion methods, such as consuming cannabis imbued food or capsules, are known to have a lower THC bioavailability than smoking. This leads to a slower onset of the ‘high’ that THC causes which users may find preferable to smoking. 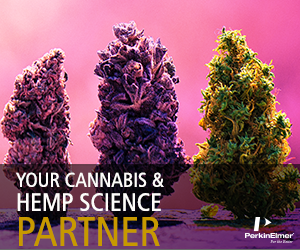 At present, little research has been done into the behavior of cannabis contaminants when ingested orally. From the study of herbal dietary supplements, it is known that the oral ingestion of materials containing high amounts of lead metal can result in elevated levels of lead metal in the bloodstream. Sustained exposure to lead is thought to contribute to high blood pressure and heart problems, as well as an increased risk of developing kidney or neurological impairments. Given what is known about the absorption of heavy metals into cannabis plant matter, one of the most pressing areas for further research will be the examination of how metal-contaminated cannabis edibles behave during oral ingestion, and if there are similar risks associated with their consumption. The nature of cannabis has given rise to multiple causes for concern with respect to contamination issues. On the whole, further study is needed in the interests of determining the safe limits of each contaminant, and how these may change depending on the method of consumption. With new routes and methods of administration constantly emerging and evolving, it is currently impossible to understand the potential impact of cannabis contamination in the real world.